36 (39, 41¾, 44½, 47½, 51¼)" bust circumference, buttoned. Cardigan shown measures 36", modeled with 1" of negative ease. Finished Size 36 (39, 41¾, 44½, 47½, 51¼)“ bust circumference, buttoned. Cardigan shown measures 36”, modeled with 1” of negative ease. Yarn Green Mountain Spinnery Mountain Mohair (70% wool, 30% yearling mohair; 140 yd 128 m/2 oz 58 g): #7704 elderberry, 8 (9, 9, 10, 10, 11) skeins. Needles Size 8 (5 mm): 40” circular (cir) and set of double-pointed (dpn). Adjust needle size if necessary to obtain the correct gauge. 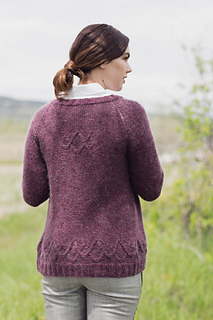 Gauge 17 sts and 25 rows = 4” in St st.
A mohair halo softens the infinite cable motifs in this simple bottom-up raglan jacket. 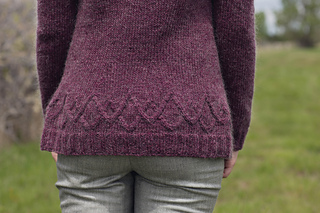 Gentle waist shaping is achieved with internal darts for lovely effect in the Paddock Cardigan. This is a simple knit that’s cozy and super wearable.